3M 3100 Aqua Burnish Pad - 19"
Every floor pad in the 3M line is designed and manufactured with a uniform coating throughout, assuring longer-lasting performance in a variety of maintenance operations. For use on softer finishes. Produces a brilliant gloss. Exceptional durability an d life. The problem solver for soft finishes. Use with Electric, Battery and Propane. Ultra High Speed 1500-3000 RPM. 3M 3100 Aqua Burnish Pad - 20"
3M 3300 Natural Blend White Pad - 19"
Every floor pad in the 3M line is designed and manufactured with a uniform coating throughout, assuring longer-lasting performance in a variety of maintenance operations. Natural hair and synthetic fiber pad. Provides excellent results on a wide variety of floor finishes and traffic conditions. For best gloss. Use with Electric, Battery and Propane. Ultra High Speed 1500-3000 RPM. 3M 3300 Natural Blend White Pad - 20"
3M 3300 Natural Blend White Pad - 21"
3M 3300 Natural Blend White Pad - 24"
3M 5100 Red Buffer Pad - 10"
3M 5100 Red Buffer Pad - 13"
3M 5100 Red Buffer Pad - 14"
3M 5100 Red Buffer Pad - 17"
3M 7200 Black Stripper Pad - 13"
Every floor pad in the 3M line is designed and manufactured with a uniform coating throughout, assuring longer-lasting performance in a variety of maintenance operations. To remove all finish, sealer and contaminants from the floor surface. Use with Rota ry or Automatic. Low Speed 175-600 RPM. 3M 7200 Black Stripper Pad - 14"
3M 7200 Black Stripper Pad - 16"
3M 7200 Black Stripper Pad - 17"
3M 7200 Black Stripper Pad - 19"
3M 7200 Black Stripper Pad - 20"
3M 7300 High Productivity Stripping Pad - 16"
3M 7300 High Productivity Stripping Pad - 17"
3M 7300 High Productivity Stripping Pad - 19"
3M 7300 High Productivity Stripping Pad - 20"
3M Niagara 3700N Super Hog's Hair Pad - 20"
Every floor pad in the 3M line is designed and manufactured with a uniform coating throughout, assuring longer-lasting performance in a variety of maintenance operations. 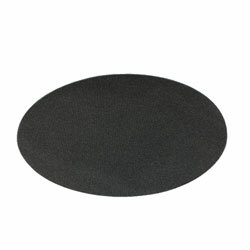 An aggressive burnishing pad to use on medium to hard finishes with machine speeds of 1500-3000 RPM.